In responding to the demand to teach Chemistry I’m afraid I made life unusually uncomfortable for the other Chemist by asking the questions that the bright students should be asking. Guilty of thinking – or trying to think, at least. My long-held understanding (1968) is that a catalyst is something present in a reaction that makes the reaction go better while remaining unchanged. The modern definition is a little better; the catalyst is chemically unchanged at the end of the reaction – so its previous form may have been lost, maybe by going from crystal to powder or solid to gas. The current definition recognises that there may have been interaction during the reaction(s) but the result puts the catalyst back. Aside: A rich Arab dies and leaves his riches to his three sons, Yi, Er and San. You know he’s rich; the estate is the herd of horses. Yi as oldest will have half the herd, Er, the middle son, will have a third and San will have a ninth. To be fair, they pick in reverse order. Obviously they don’t kill any horses. So, readers, how many horses are there and how do they succeed in fulfilling the Will? Should we assume that all reactions may have a catalyst? Basically, yes. Is there an opposite? Yes, it is called an inhibitor. 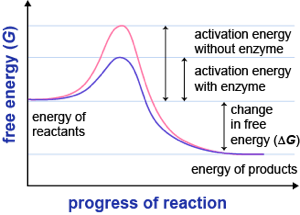 Current chemistry thinking says that the idealised reaction between only the reactants, completely uncatalysed, requires a given activation energy to occur. The molecules (ions, atoms, etc) bounce off each other with sufficient energy to exchange material. The alternative, catalysed, reaction provides alternative, lower activation energy levels which means the reaction will go faster than the uncatalysed one at the same temperature; more collisions have the energy to achieve the transition state. Researching the mechanisms by which catalysts work forms a substantial part of modern chemistry. The reason is simple; industrial chemistry is a big business and catalysts make those processes go faster (or cooler or at a lower pressure) and all of that means the process is less expensive. The mechanisms are rarely simple and we might group the types: they can change the reaction environment (for the better); they can bind in some way to the reagents, possibly forming bonds; they can form intermediate products alien to the uncatalysed reaction; or cause the reagents to change their nature by perhaps disassociation to more reactive forms. We learn at GCSE that reaction rates respond to changes of temperature, pressure, surface area, concentration, and catalysis. It seems obvious that the catalyst will usually be more effective if it is presented in a form with a large surface area. To quote wikipedia, Although catalysts are not consumed by the reaction itself, they may be inhibited, deactivated, or destroyed by secondary processes. In heterogeneous catalysis, typical secondary processes include coking where the catalyst becomes covered by polymeric side products. Additionally, heterogeneous catalysts can dissolve into the solution in a solid–liquid system or sublimate in a solid–gas system. This diagram is from schmoop.com & I pair it with this quote from Linus Pauling (1948): “a catalyst must [..] bind the transition state more tightly than the substrate.” A catalyst in biology is called an enzyme. Pauling suggested that antibody molecules (immune system proteins that bind foreign molecules) that can be made to bind to transition state analogs of a substrate, should also presumably catalyse the conversion of substrate, through the transition state, to product. I lose the will to live somewhere in this writing each time I read it and I found CSBSU’s writing sent me quickly to sleep; it stopped being interesting and was all presented as old, therefore not exciting. Pauling was proved right in the naughties. Enzyme activity. A substrate or substrates bind to the active site of the enzyme forming the enzyme / substrate complex, which then dissociates into enzyme and product(s). The enzyme may catalyze the addition or removal of a molecule or a portion of a molecule from the substrate to produce (a) the product, or (b) the enzyme may catalyze the splitting of a substrate into its component subunits. If you stayed interested, then the issue in the catalytic chemistry is which electrons are being grabbed from where and you are likely chasing differences between sp2 and sp3 orbitals to find the differences in energy levels. I’m interested in how the exchange of energy takes place. Molecules (ions, atoms, whatever) collide – they are the bounciest things we have discovered; so what proportion of collisions do something? Is it the bounce that transfers energy between molecules and so displaces electrons ? - it would seem so. 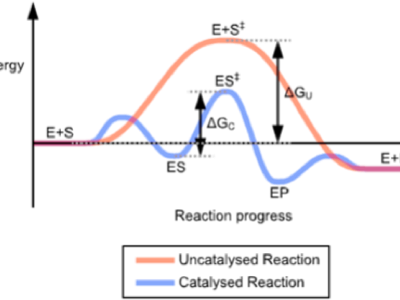 The overall thermodynamics don’t change between the two systems, but the energy required to make the reaction occur is less, sometime substantially so. The graph at the top represents one such reaction and you see that the start and finish are in the same place but the area under the curve represents the energy required for the two routes and the catalysed reaction will be, for want of a better word, cheaper. Where the alternative is worse than uncatalysed, we have an inhibitor, or a poison. How do you track what moves? One way is to use isotopes, such as knowing which of ₃₅Cl and ₃₇Cl started where in the reaction. When I was reading this up for the lessons I was supposed to be delivering I came across zeolites for the first time. Many catalysts are found in the transition metals, though actually acids are the widest used (ionising the water, often). Zeolites are porous, so offer a large surface area; they can be doped to include a range of light cations (Na, Ca, Mg, K) and act as sieves, excluding large molecules. The creation of synthetic zeolites is a big business; they’re good at removing SO₂, CO₂ and H₂O from natural gas, they’re useful in catalytic cracking, they make good filters in the nuclear business. The biggest user by far is the laundry detergent market, maybe for making tablets; I found references to the ‘detergent builder business’ – do tell me what this is about, as I come up against the “I’m not at university so I must pay for reading stuff” problem. 20141107 Issues with uploads resulted in the graphs being lost. They may now not be correctly attributed. It took several re-writes before the file would upload, by which time the article had shrunk. looks like a fairy’s trainer footprint, doesn’t it? Maybe fairies are smaller than we have been led to believe... sorry picture lost in the re-treading. 05 Dec 2011 http://blogs.rsc.org/ob/2011/12/05/hot-classifying-one-pot-catalysis/ By Francesca Burgoyne. Take a look at this Emerging Area article from Nitin Patil et al. who propose a classification system to update the definition of one-pot catalysis. They give readers recent examples of metal-metal, metal-organo and organo-organo catalytic systems that fall into the three categories of cooperative, relay and sequential one-pot catalysis. 1 1/2+1/3+1/9=17/18 (obvious, I think, and I thought so when I first heard the problem). Add the donkey to 17 horses, do the division of the herd, have 1/18 left over. Give back the donkey. The donkey is unchanged by the experience, or not appreciably so. If the herd is bigger, 17N, borrow N donkeys and be sure to return them safely. Er will do best, on balance, though San will pick what he thinks are the best two stallions, or one stallion and his favourite because he is a romantic. Another solution is wait until the first pregnant one foals and give the foal to the agent (the bright person with the answer). Alternative question starts with only stallions in the herd. Scientists have developed a simple two-molecule chemical analogue of an enzyme and its substrate that neatly illustrates the fundamental principles of biological catalysis.1 The reaction provides a synthetic model of a biological catalyst for students of biochemistry that is simple to visualise and understand and, according to one expert, is likely to become a ‘classic illustration’ of the tenets of enzyme catalysis. 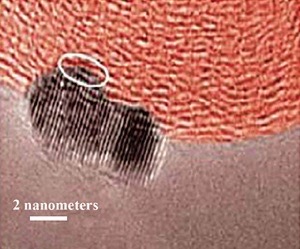 The model could also open new approaches to biomimetic catalysts. In 1948 Linus Pauling suggested that enzymes work by binding transition states more strongly than they bind their substrates, and 10 years later Daniel Koshland proposed that the conformation of an enzyme’s active site alters to accommodate the substrate – by an ‘induced fit’ mechanism. But demonstrating these ideas in protein catalysts has been difficult because of their vast size and complexity. Now, researchers from the labs of Jay Siegel in Tianjin University, China, and the University of Zurich in Switzerland, and Fraser Stoddart at Northwestern University, US, have come up with a simple analogue to demonstrate these key dictums of biological catalysis. The team used the rectangular cyclophane ExBox – an extended bipyridine box structure – as the ‘active site’. The bowl-shaped polycyclic aromatic hydrocarbon corannulene filled in as the substrate and bowl-inversion as the reaction. Corannulene nestles in the ExBox cavity, such that the bowl is slightly flattened and the cavity is slightly expanded to optimise binding – an induced fit. The flat transition state to inversion is stabilised within the cavity, which results in the inversion process being accelerated 10-fold by the ExBox. This sequence of events, together with the associated binding energies of the ground state corannulene and its planar transition state, was confirmed by NMR, crystallography and isothermal calorimetry, and independently correlated computationally. ‘We are able to demonstrate in an incredibly simple system all the principles laid out for much more complex biosystems, and can tease out all the relevant parameters such as the relative contribution to the catalytic effect of the induced fit and the optimal binding of the planar transition structure,’ says Siegel. Rudolf Allemann, an enzymologist at Cardiff University in the UK, says the system is ‘a particularly intriguing and simple example of the combined effects of ground state destabilisation and transition-state stabilisation’. Allemann adds that while ‘the catalytic effect observed in this synthetic system falls significantly short of those typically achieved by enzymes, ExBox4+ may still guide the design of other synthetic agents that use nature’s tricks to catalyse chemical reactions’.